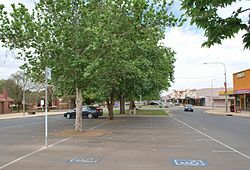 Griffith /ˈɡrɪfəθ/ is a major regional city in the Murrumbidgee Irrigation Area that is located in the north-western part of the Riverina region of New South Wales, known commonly as the food bowl of Australia. It is also the seat of the City of Griffith local government area. Like the Australian capital, Canberra, and the nearby town of Leeton, Griffith was designed by Walter Burley Griffin and Marion Mahony Griffin. Griffith was named after Arthur Hill Griffith, the first New South Wales Minister of Public Works. Griffith was proclaimed a city in 1987, and had a population of 19,144 in 2016. It can be accessed by road from Sydney and Canberra via the Hume Highway and the Burley Griffin Way and from Melbourne, Victoria, via the Newell Highway and either by using the Kidman Way or the Irrigation Way. Griffith can be accessed from other places like Adelaide, Orange, New South Wales, and Bathurst through the Mid-Western Highway and the Rankins Springs road from Rankins Springs and the Kidman Way from Goolgowi. Griffith and other towns were created as part of the New South Wales State Government's Murrumbidgee Irrigation Area (MIA) project, a plan to supply irrigation from the Murrumbidgee river in order to open up western New South Wales for farming . The town plan for Griffith, and nearby Leeton, was designed by Walter Burley Griffin in 1914, an unusual geometric pattern centred on a set of circular streets, with broad avenues radiating out in an octagonal arrangement. The streets were surveyed mostly according to that plan, and Griffith was declared a town in 1916. The main dam of the scheme was the large Burrinjuck Dam on the Murrumbidgee between Gundagai and Canberra, but was not completed until 1928. The Berembed Weir, near Narrandera, was built in 1912, diverting water from the Murrumbidgee River into the Bundidgerry Creek then into the Main Canal of the MIA at Narrandera. The Canal, almost a river in its own right, flows through the MIA, supplying water to the entire area, then flows through Griffith as part of the geometric plan, and peters out to the northwest of the town in rice farms. From the start of the MIA, citrus and other fruit and vegetables were grown in abundance around Griffith. In the 1950s the irrigation area expanded to include large rice farms. Vineyards were established early, and wineries followed, beginning with at Hanwood and Yenda, two villages just outside the city. The Italian influence expanded the range of fruit and vegetables, and also significantly increased the number of wineries and the range of wines produced by the existing wineries in the region, such as . De Bortoli, Rosetto and other wineries were established by Italian immigrants, and today they are well known around Australia. In recent times they have been joined by one of the country's best known wine labels, Yellow Tail, produced by Casella Family Brands. Casella, DeBortoli, McWilliam's, Warburn and Berton Vineyards are now among the top 20 wine producers in Australia. Griffith has a semi-arid climate (BSk) under the Köppen climate classification with hot summers and cool winters. Extreme temperatures at Griffith Airport AWS have ranged from 46.0 °C (114.8 °F) on 23 January 2001 to −5.9 °C (21.4 °F) on 17 July 1977. During a heatwave on 10 February 2017, temperatures reached 45.8 °C (114.4 °F), a new record high for February. Griffith is the regional service centre for the vast Murrumbidgee Irrigation Area, one of the most productive agricultural regions in Australia. Thanks to irrigation, Griffith is rich in agriculture and the city is also known as Australia's "Wine and Food Country". Griffith is home to the Riverina's largest employer, the Baiada Group. Griffith also has several wineries, including De Bortoli Wines and Casella Family Brands (makers of Yellow Tail wine). In addition to Griffith, the area includes the towns and villages of Willbriggie, Hanwood, Beelbangera, Bilbul, Yoogali, Widgelli, Yenda, Lake Wyangan, Tharbogang and Warburn. The city contains the main suburbs of Collina, Driver, North Griffith, East Griffith, West Griffith, South Griffith, Murrumbidgee, Mayfair, Pioneer Mooreville and Wickhams Hill. The newest development of the suburb Collina has been constructed to the north east of the city's centre. In the 2016 Census, there were 19,144 people in Griffith. Aboriginal and Torres Strait Islander people made up 5.0% of the population. 68.3% of people were born in Australia. The next most common countries of birth were India 4.7%, Italy 4.4%, New Zealand 1.8%, Philippines 1.0% and England 0.9%. 67.3% of people spoke only English at home. Other languages spoken at home included Italian 7.5%, Punjabi 3.6%, Gujarati 1.2%, Samoan 1.1% and Mandarin 1.1%. The most common responses for religion were Catholic 37.4%, No Religion 14.2% and Anglican 12.6%. Griffith also has 13 primary schools and various day care and pre-school facilities. Griffith has one of the largest campuses of Riverina Institute of TAFE. There has been recent[when?] plans to construct a fifth campus of Charles Sturt University in Griffith. Griffith is a major junction for the Kidman Way, Burley Griffin Way and Irrigation Way. Griffith is located 550 km west of Sydney via Burley Griffin Way and Irrigation Way and 450 km north of Melbourne via the Kidman Way. Griffith has daily bus services to the major metropolitan areas. Griffith Airport operates daily flights to Sydney (Melbourne in the past, but not currently). The railway reached Griffith on 3 July 1916 and since that date has provided a service transporting passengers and goods into and out of the area. Regular goods trains continue, making it a unique railway centre. Griffith railway station is served by a weekly NSW TrainLink Xplorer service from Sydney. NSW TrainLink also operates a daily road coach service from Mildura to Wagga Wagga stopping at Griffith. This service connects at Wagga Wagga with NSW Trainlink rail services to Sydney and Melbourne. V/Line operates a daily rail/road coach service between Melbourne and Griffith, changing with the train at Shepparton. Melbourne (Southern Cross Station) to Griffith (Bus Terminal at Visitors Centre) is an evening service (daily); Griffith to Melbourne service is overnight (Mon to Sat) / afternoon (Sunday). Travel time is approximately six and a half to seven hours. Local radio stations broadcasting from Griffith include ABC Riverina, AM radio commercial station 2RG, FM radio commercial station and a rebroadcast from sports station Sky Sports Radio. Other local stations include Christian radio station Vision Radio Network and the community station 2MIA FM. The ABC's national stations ABC Radio National, ABC Classic FM, ABC NewsRadio and Triple J and the multicultural network SBS Radio are broadcast into Griffith. ABC Riverina, is the local ABC station in Griffith, servicing the entire MIA region. It broadcasts a local breakfast show and a local morning show each weekday broadcast from the ABC studios in Wagga Wagga. Wednesday and Saturday's local morning show is also broadcast to each station on the ABC Local Radio network enabling listeners from outside of the local listening area to call into the popular gardening talk back program. ABC Riverina also has a local news service, produced by local journalists. As well as rural reports, The station also airs a local Saturday breakfast show, which is followed by a local Saturday morning sports program. Apart from local programming, ABC Riverina takes national programs like AM, Conversations, The World Today, PM, Nightlife, Overnights, Grandstand, Saturday Night Country and Australia All Over along with a mid-afternoon program, an evening show and a weekend morning program, all broadcast from Sydney, along with a drive program, broadcast from regional NSW. Other national ABC services that are available in Griffith on separate FM frequencies include Triple J, RN, ABC Classic FM and ABC NewsRadio. 2RG is the Griffith-based commercial FM station owned by Southern Cross Austereo broadcasting from Griffith studios during the day, and then taking networked programming sourced from 2GB Sydney, Gold FM on the Gold Coast, Authentic Entertainment Sydney and Triple M. 2RG in Griffith also produces a local news service with a journalist based at the station, compiling and recording local news bulletins for 2RG and sister station 99.7 Star FM. Star FM, also owned by Southern Cross Austereo, is a commercial FM station servicing Griffith on a local FM frequency, although its local breakfast show is broadcast from a studio in Griffith. Star FM is skewed towards the younger listeners with a Top 40/pop music format. Following the local breakfast show, the station takes Hit Music Network programming sourced from Southern Cross Austereo's hub at Sea FM on the Gold Coast or from metropoliton stations such as 2Day FM Sydney and Fox FM Melbourne. 2MIA is the local community station, broadcasting local programs, presented by radio announcers. The station is skewed towards the older demographic and plays a lot of music. All programs are locally produced apart from the regular programming the station takes from the national community radio network. Griffith is served by five television stations, three commercial television stations (WIN Television, Seven Network and Nine Network) which are regional affiliates of the three Australian commercial television networks (Ten, Seven and Nine), and public broadcasters the ABC and SBS. Until the 1990s, Griffith received only the ABC and MTN, an independent television station showing programmes from all three commercial networks. The town receives the commercial networks' digital channels (7Two and 7mate from Seven, 9Go! and 9Gem from Nine and One and Eleven from WIN Television), as well as TVSN, Gold, ABC2/ABC Kids, ABC3, ABC News 24, SBS 2, Food Network and NITV. Foxtel provides subscription satellite television services. MTN carries programming from Seven Network, MDN carries programming from Nine Network and AMN carries programming from Network Ten, WIN also broadcasts the Riverina and MIA WIN News bulletin each weeknight. Regional news coverage of the Griffith and MIA area is provided on all three commercial networks with WIN Griffith airing 30-minute local news bulletins at 6pm each weeknight. WIN News are produced from newsrooms in the city but presented from studios in Wollongong. The Area News is a daily newspaper published in the city each Monday, Wednesday and Friday, as well as national newspapers such as The Australian, The Daily Telegraph, Herald Sun, The Weekly Times and The Age. Griffith has many tourist attractions. These include Pioneer Park, a 510-seat Regional Theatre, the Italian museum, the Griffith Regional Art Gallery, craft and antique shops, and its many high standard restaurants. Many of the Griffith wineries also have wine tasting at the cellar door, notably De Bortoli Wines, McWilliams, Beelgara Estate (formally Rossetto Wines), West End Wines, Berton Vineyards and Warburn Estate. Griffith is famous for its botrytis including Debortoli's Noble One and its fortified wine such as McWilliam's Hanwood Port. Ecotourism is also available in Griffith. Scenic Hill has various walking trails, lookouts and is home to the famous Hermit's Cave. Nericon Swamp, part of the Griffith Wetlands Important Bird Area, is an important site for migratory birds. Nearby Cocoparra National Park offers walking trails and there are opportunities to explore along the Murrumbidgee River and Lake Wyangan. Evonne Goolagong, former World No. 1 Australian female tennis player. Phillip Noyce, director of the 2002 film Rabbit-Proof Fence and the 2010 American film Salt. Robert Trimbole, Italian-Australian drug baron, organised crime boss and businessman. Joseph Colpitts, Sgt, Australian Infantry. Fought in nine countries during WWII. Helped rescue many allied soldiers from occupied Crete whilst fighting with the Greek Resistance. Former Manager of Griffith Baths. Colpitts Place in Griffith is named in his honour. ^ a b c Australian Bureau of Statistics (27 June 2017). "Griffith (NSW) (Significant Urban Area)". 2016 Census QuickStats. Retrieved 14 February 2019. Material was copied from this source, which is available under a Creative Commons Attribution 4.0 International License. ^ Kelly, Bryan Morris (1988). From wilderness to eden : a history of the City of Griffith, its region and its people. Griffith, N.S.W. : City of Griffith Council. p. 18. ISBN 0-7316-3994-4. ^ Macquarie ABC Dictionary. The Macquarie Library Pty Ltd. 2003. p. 430. ISBN 1-876429-37-2. ^ Nairn, Bede (1983). "Griffith, Arthur Hill (1861–1946)". Australian Dictionary of Biography. 9. Canberra: Australian National University. Retrieved 8 March 2016. ^ a b c "History of Griffith". Griffith City Council. Archived from the original on 2008-07-19. Retrieved 2008-08-16. ^ "Berembed Weir and Site". NSW Heritage Branch. Retrieved 21 November 2010. ^ "Italian Story". Australian Broadcasting Corporation. 2004. ^ "Aussie Bob, the panel beater who became a millionaire". The Age. 16 May 1983. ^ "Sikh community continues tsunami relief efforts". ABCNews. 4 January 2005. ^ "Hermit's Cave Complex". New South Wales State Heritage Register. Office of Environment and Heritage. H01766. Retrieved 18 May 2018. ^ "Monthly climate statistics". Bureau of Meteorology. Retrieved 27 October 2010. ^ "Sustainable Agriculture in the Lower Murrumbidgee Catchment" (PDF). European Geosciences Union. Institute of Hydromechanics and Water Resources Management. Retrieved 10 October 2008. ^ "Vacations Griffith - Australia". www.placesonline.com. Retrieved 2010-02-28. ^ "Union fears more Baiada job cuts". www.abc.net.au. 31 July 2009. Retrieved 2010-02-28. ^ Tyson, Ross (28 March 2008). "Council says no to lights". . Fairfax Digital. Archived from the original on 8 July 2012. Retrieved 8 April 2008. ^ Tyson, Ross (5 February 2010). "Busy intersection lights up". The Area News. Fairfax Digital. Archived from the original on 6 July 2011. Retrieved 6 February 2010. ^ BirdLife International. (2011). Important Bird Areas factsheet: Griffith Wetlands. Downloaded from http://www.birdlife.org on 30/06/2011. ^ a b c d "International Relations". Griffith City Council. Archived from the original on 22 March 2012. Retrieved 8 August 2013. ^ "Doings in Different Districts". The Riverine Grazier. New South Wales, Australia. 17 November 1942. p. 1. Retrieved 13 May 2016 – via National Library of Australia.